Having started business in 1823 as an Irish immigrant with a small lace and linens shop, Alexander Turney Stewart was among the wealthiest men in the United States by 1848. That year he built a magnificent emporium dubbed the Marble Palace at the corner of Broadway and Chambers Street. His was the largest such store in the world and he was not done yet. In 1862 Stewart spent an astronomical $2.5 million dollars—about $45 million today—to erect an uptown branch on Broadway extending back to Fourth Avenue along 10th Street. His 6-story cast iron structure, designed by John Kellum, was built to be fireproof and the new technology allowed larger window area and, therefore, increased daylight inside. 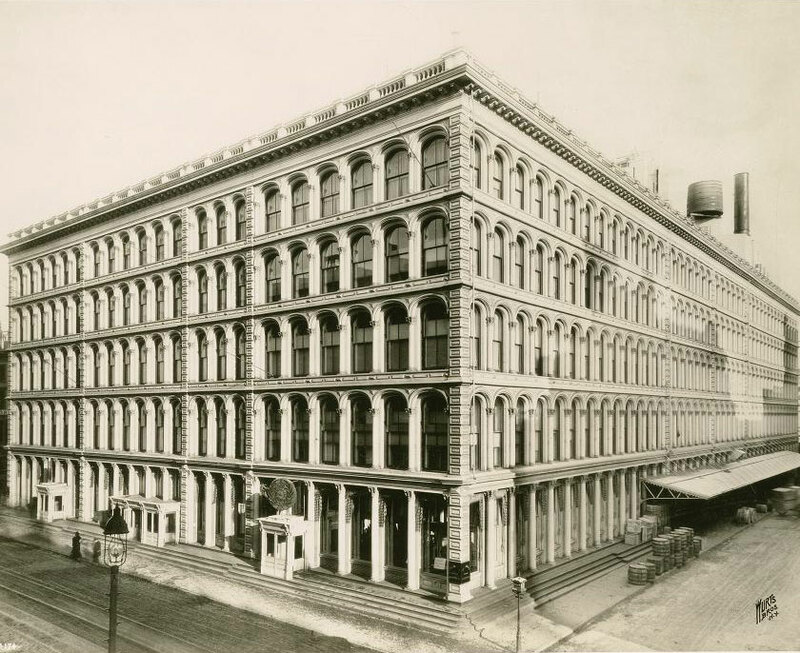 The gargantuan store became known as the Iron Palace and The New York Tribune called the two buildings “the proudest monuments of commercial enterprise in the country.” In 1870 the store was enlarged, now filling the entire block from 10th to 9th Street. Stewart died in 1876 but the A. T. Stewart & Co. store on Broadway and 10th Street continued on for six years. Hilton, Hughes & Co. took over the operation in 1882 but failed four years later. In November 1896 Philadelphia retailer John Wanamaker opened his New York operation in the building. And if Alexander Stewart thought big, John Wanamaker thought bigger. A year later construction started on the immense 12-story emporium designed by the Chicago architectural firm D. H. Burnham & Co. It would take three years for the structure to be completed. The stately Italian Renaissance building clad in terra cotta cost $3.5 million. It was the product of three years of research into department store design throughout the United States and Europe. The old Stewart building was connected to the “Annex” by an enclosed bridge, called The Bridge of Progress, and a tunnel under 9th Street. The original building was now used for women’s merchandise only; the new building sold menswear, and furnishings and decorations for the home. The New-York Tribune on April 22, 1906 called the new structure “one of the most elaborately fitted up and furnished department stores in the United States, if not in the world.” It would be a store like no other. For those “slightly tired of shopping,” there was also the auditorium. With a seating capacity of 1,300 and rising three stories it was one of the largest theaters in New York. Murals were painted by Frederick K.Frieseke, of the Societe Nationale des Beaux Arts of Paris. Here the Austin organ not only had 64 stops, but two chimes of bells, a snare drum, kettle drums, cymbals and triangle. Free, nearly daily concerts were offered for shoppers. There were also a golf school, a restaurant capable of serving over 1,000, a telegraph service, a post office, theater ticket office, railroad ticket office, Red Cross Headquarters, and hair salon. To give homeowners ideas on decorating, a two-story house was incorporated into the store. The Wanamaker booklet described The House Palatial as “containing twenty-four rooms designed in correct period or modern style, and every room in the house obviously different in character, although all help to make up a harmonious whole. It represents the best of the house designing, furnishing and decorative arts.” More than a million people every year visited The House Palatial. On April 24, 1928 the section of 9th Street between Broadway and 4th Avenue that separated the old and new Wanamaker buildings was renamed by the Board of Aldermen to Wanamaker Place. The gesture was in honor of the public services of the late Rodman Wanamaker; however it also paid tribute to the gargantuan retail establishment that straddled the street. By the middle of the 20th century the shopping district had moved northward. Rather than move with it, Wanamaker decided in 1954 to simply close the business. Although 1,500 unionized employees voted unanimously to try to purchase the business as a partnership with the help of investment bankers, the venture did not materialize. Nine days later crowds of people lined the sidewalks along Union Square as S. Klein’s department store began selling off the Wanamaker goods. The firm had purchased $2.5 million worth of stock and offered it to the public at discounted prices. In the meantime, a real estate syndicate purchased the once-proud Wanamaker buildings. No. 770 Broadway, the Annex, was converted to an office building and quickly filled with occupants. In 1956 Chase Manhattan Bank leased three full floors and the Atlantic Mutual Insurance Company took the 7th and half of the 6th Floor. As for Alexander Stewarts magnificent Iron Palace of a century earlier, plans were set to demolish it. But before the wreckers could start, a fire broke out. John Kellum’s fireproof structure proved to be that. The flames raged out of control for a full 24-hours before firefighters were able to extinguish it. Afterwards, surrounding the gutted remains, the noble cast iron façade still stood. After the ruins were removed an uninspiring white-brick apartment building was constructed in its place in 1960. The 21-story structure was named with a nod to the original store—the Stewart House. The Wanamaker “Annex” survives today as 770 Broadway. The subway station that unloaded shoppers into one of the nation’s most renowned retail establishments now deposits them into a K-Mart. Among its many tenants are the corporate headquarters of AOL, Vornado and J. Crew. Today all the thoughts of organ concerts in a splendid auditorium, an Oriental Shop that sold “mandarin embroideries and fascinating bronzes,” and the Burlington Arcade that reproduced the arcade in Piccadilly, London are gone. The lone reminder of the once-magnificent department store is the green-and-white street sign on the corner: Wanamaker Place.